The Battle of Antietam, in the bucolic Maryland countryside, was the bloodiest day in American history. 22,717 men killed, wounded or captured in twelve hours of fighting on September 17, 1862. The Battle of Antietam was the consequence of an effort by Confederate Commander Robert E. Lee to take his Army North and relieve pressure on his native Virginia, which had seen so much of the fighting in the war to that point. Moreover, a decisive victory in the North might, Lee thought, bring the war to a swift conclusion. It was also a seminal day in the history of photography. 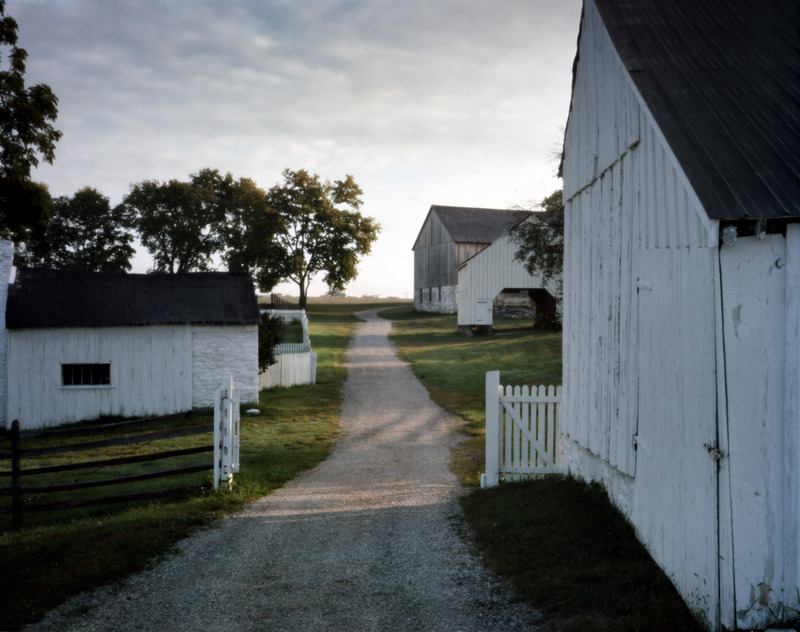 Antietam is the birthplace and, the days immediately following the battle, the birthdate of war photography. 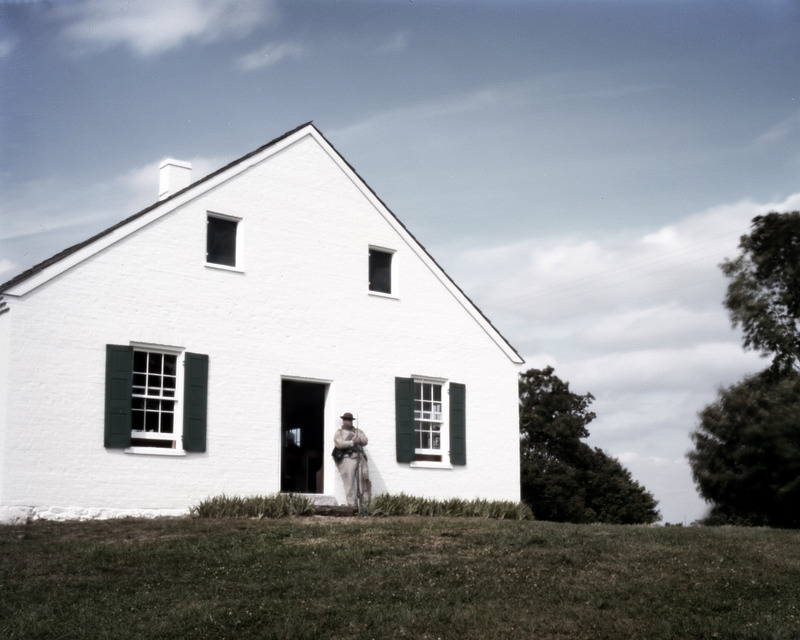 Matthew Brady dispatched photographer Alexander Gardner and his assistant, James Gibson, to Antietam two days after the carnage, the battlefield still strewn with the dead, and again two weeks later when President Lincoln came to inspect the scene. I arrived in Sharpsburg before dawn on Sept. 17th 2012. 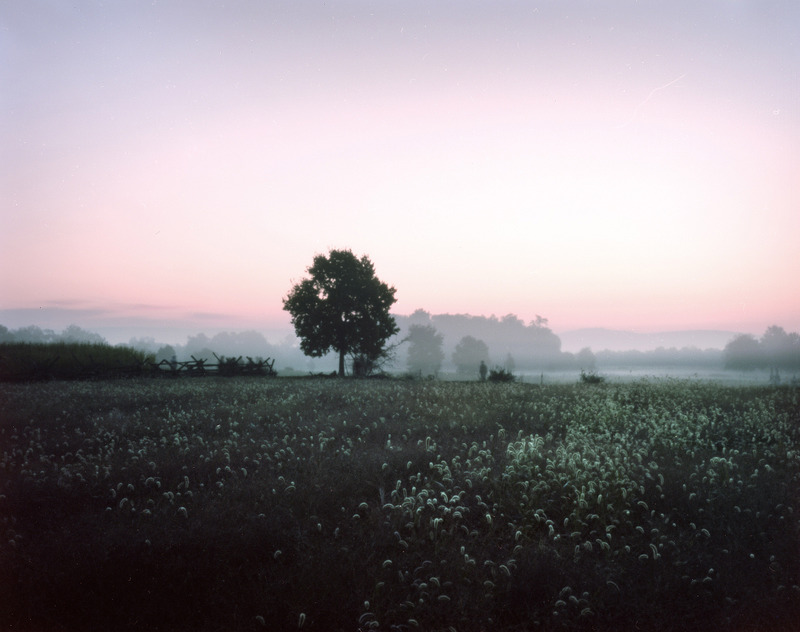 Driving through the dark, sleepy Maryland countryside, I could plainly see the early morning fog filling the hollows in the fields and farms along the way. The skies were clear, though, and I knew this would be a beautiful day to see the battlefield. I was accompanied on this trip by my friend, filmmaker Ruben Collado. 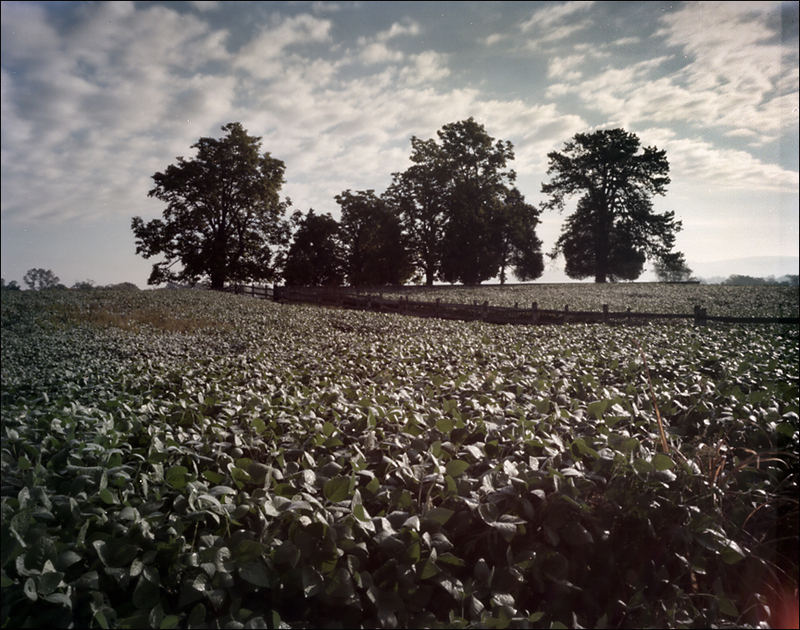 Ruben had agreed to accompany me at a couple of battlefield and reenactment events to create a short film about the Civil War 150 Pinhole Project. The predawn light was very low, the first exposure was over 6 minutes in length. This image, above, captured that early morning light beautifully and I had, in addition to this dramatic low light, re-enactors walking through the landscape creating some ghostly figures within the image. After taking this photo, a cannon-shot! marked the crack of dawn and the beginning of the battle. As I turned into The Cornfield, I was met by a group of Confederate re-enactors leaning on a fence rail. One of the re-enactors called out to me, “Hey, didn’t we meet at Manassas?” Thus began a day of synchronicity and surprises. The Battlefield at Antietam is one of the most beautiful Civil War Battlefields we have. The countryside here in Maryland is stunning and hilly, with rolling fields laced with creeks and broken by tracks of woods, and framed by the distant Blue Ridge Mountains. 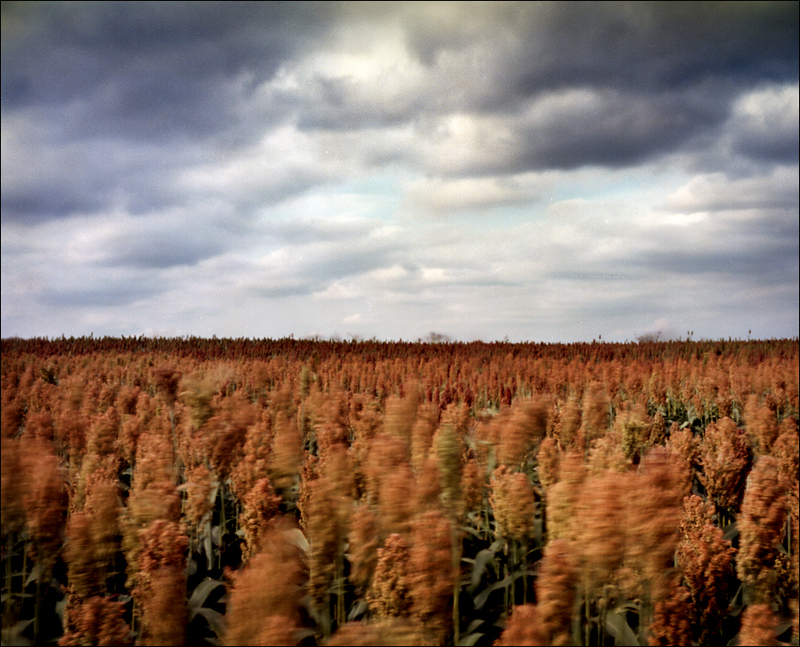 My first approach on the battlefield, wading through waist-high fields of soybeans and sorghum, left me soaked with morning dew. After photographing this group of re-enactors and exchanging email addresses, I was startled by a fusillade of musketry from further down in The Cornfield. It was a group of “Black Hats,” Union re-enactors who had formed a skirmish line, firing their muskets as they made their approach through The Cornfield. This was totally unexpected. The Park Service doesn’t allow for reenactments on any Civil War battlefields, which are considered “hallowed ground.” They don’t want anything to happen there that might be disrespectful to the dead. But, on this, the150th anniversary, the Park Service allowed this small band of re-enactors to execute this assault, and presenting me with an incredible and entirely unexpected opportunity. I thought for a split second, and then quietly asked the officer if he could have his troops about-face and shoulder their firearms. That way I could set up my new, 8×10 pinhole camera, and, looking through the corn, capture the backs of the troops as they faced the rising sun. “Remain still,” he had said, unprompted, the perfect instruction. A chill went through me. I would have but one opportunity to make this photo, one frame, so it had to be right. 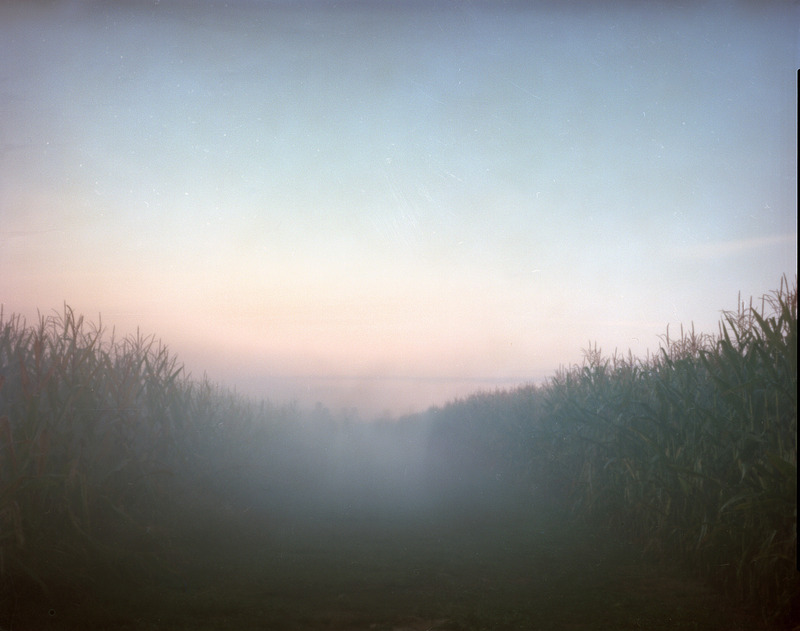 These are the moments when a pinhole camera becomes enormously challenging. There is no viewfinder. 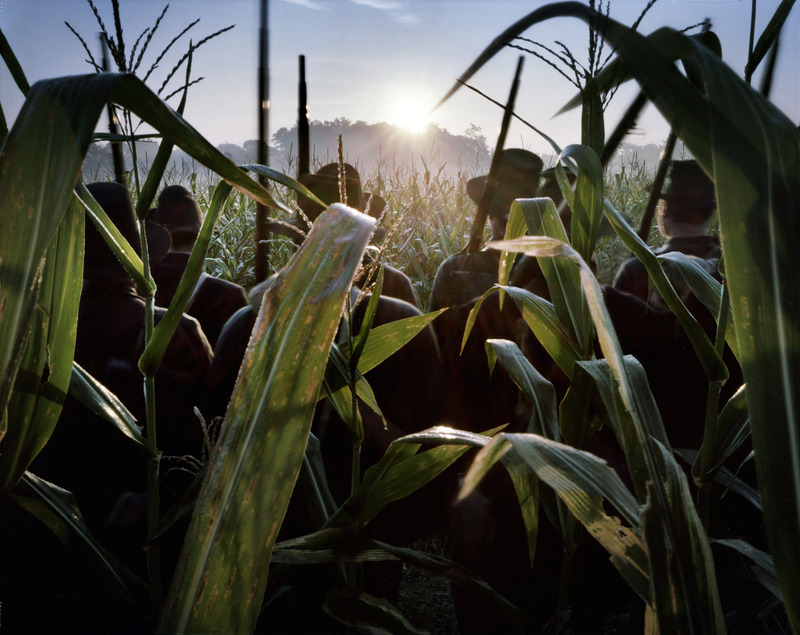 For the picture I intended, I knew I would need to have the camera above my head and slightly angled down, to look through the corn, capture the troops and see the rising sun. I did it, by eye and instinct, making one exposure. I was surrounded by people but I was alone, on cloud nine, totally in the moment, the project blossoming before me. There are moments, in your work, when everything is going beautifully right, vaulting you into a transcendent existential and spiritual high, in which beauty and purpose become one. I feel totally “full” at those moments – completely honored, humbled and happy to be alive and wondering at the world. The fighting would go on for twelve continuous hours that day at Antietam, the carnage beginning here in the Cornfield. 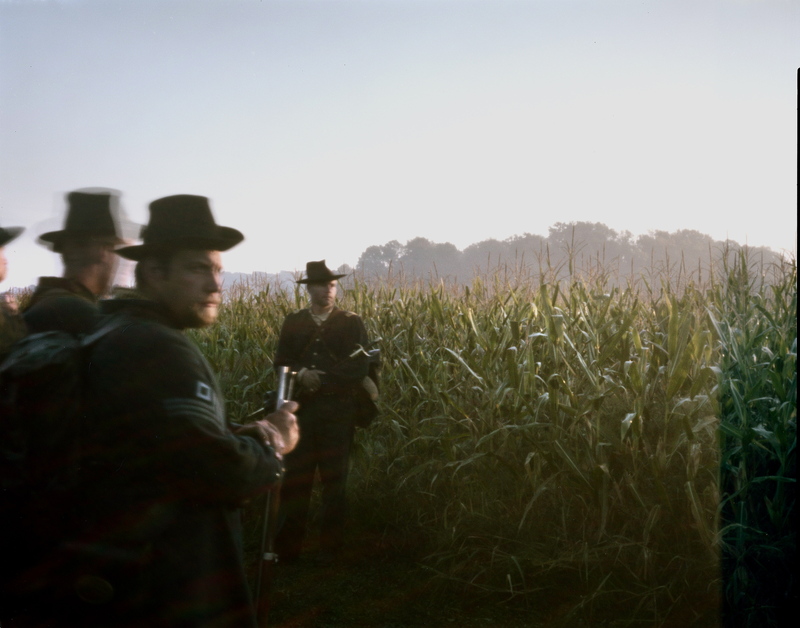 At dawn on September 17th, 1862, the first shots of this epic battle would ring out, three hours later 13,000 troops of both sides, lay dead or wounded in and around this Cornfield. The fighting was brutal. The fighting later in the afternoon was focused on what was known as the Sunken Road, facing the Mumma and Roulette Farms, where the Confederate soldiers could hunker down to wait for the eventual Union assault. When it came, thousands of Union troops marched to within 60 yards of the Sunken Road, only to be turned back with heavy casualties, wave after wave, throughout the afternoon. But eventually the Union troops attained a flanking position, raining fire down on the Confederate troops now trapped in their position. The Confederates retreated, the best they could. 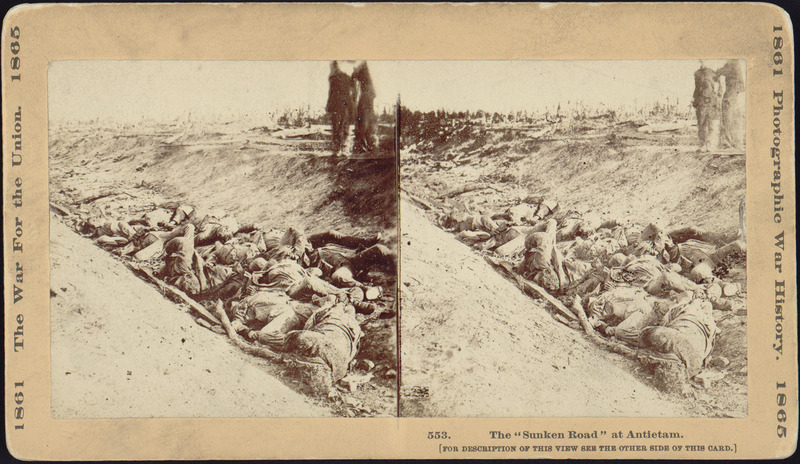 Sunken Road was now Bloody Lane, and it was here that Brady’s photographer captured the images of dead Confederate troops, piled one against the other in this trench in the manner of a mass grave. But, the Union army’s breakthrough at the Sunken Road was costly and short-lived. Confederate forces sealed the breech and fighting in this sector of the battlefield quieted. But the day’s fighting was not done…. 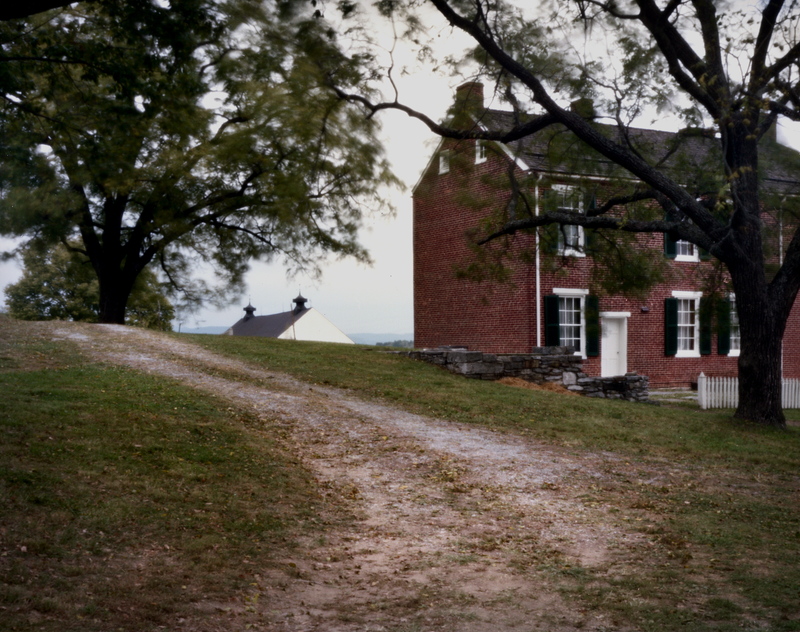 With the battle stalemated, Gen. McClellan, headquartered at the nearby Pry House, sent word to his subordinate, Gen. Burnside on the Union Army’s left flank, to commence his attack across Antietam Creek. This, McClellan hoped, would relieve pressure on other sectors of the battlefield while hammering another part of the Confederate line. 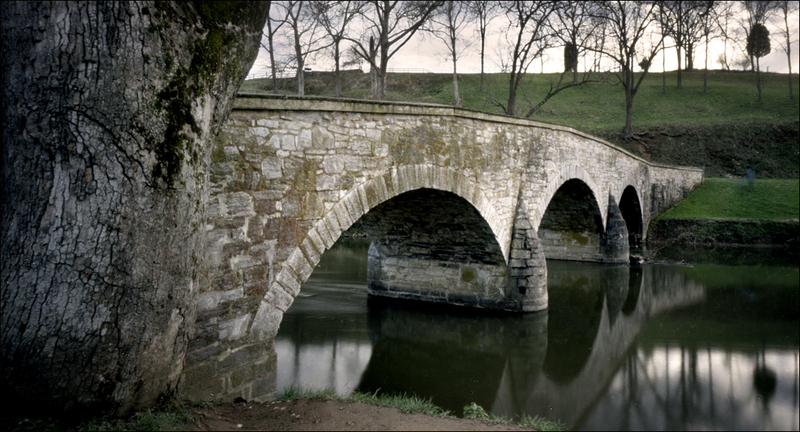 Gen. Burnside had the difficult task of getting his troops across the creek with no other route except a one-lane stone bridge, now bearing his name – Burnside’s Bridge. Confederate sharpshooters dug in on the opposite bank made this an extremely deadly prospect. Gen. Burnside’s troops, after repeated setbacks, did finally get across the Antietam, and began to push the Confederate Army back into the town of Sharpsburg. The Confederate Army was in danger of being completely flanked until the timely arrival of Gen. A.P. Hill’s Confederate troops, arriving after a forced march from Harper’s Ferry. Hill’s troops’ line of march brought the Confederates into the flank of the Union troops, stopping the Union assault in its tracks. Burnside eventually had to pull his troops back, beyond the Antietam, to escape annihilation. The terrible fighting of the Battle of Antietam had ended. After our morning in The Cornfield, Ruben and I moved onto other sections of the battlefield the rest of the day – the Mumma Farm, the Sunken Road, the Pry House, Burnside’s Bridge, as well as the Confederate positions on the hilly terrain outside the town of Sharpsburg. Walked the Union approach to the Sunken Road through the fields of the Roulette Farm. There is a slight rise in the field as you approach the Confederate line and the Sunken Road. The Road, entirely invisible until you crest that rise….When you do, you’re only about 60 to 100 feet from the rail fence and Sunken Road. When Union troops crested that rise they were met with a hailstorm of lead and exploding shells. Memoirs of troops that fought at Antietam speak to the horrible drama of this terrain. To the Confederates, it was the experience of watching the Union Troops attack in perfect formation, disappear into the ground, and reappear slowly, the tops of flags, rifle bayonets and then tops of the heads of the Union troops as they came over the rise just a few feet away. To the Union troops, it was a killing ground where they fought a stand-up fight, at close quarters. 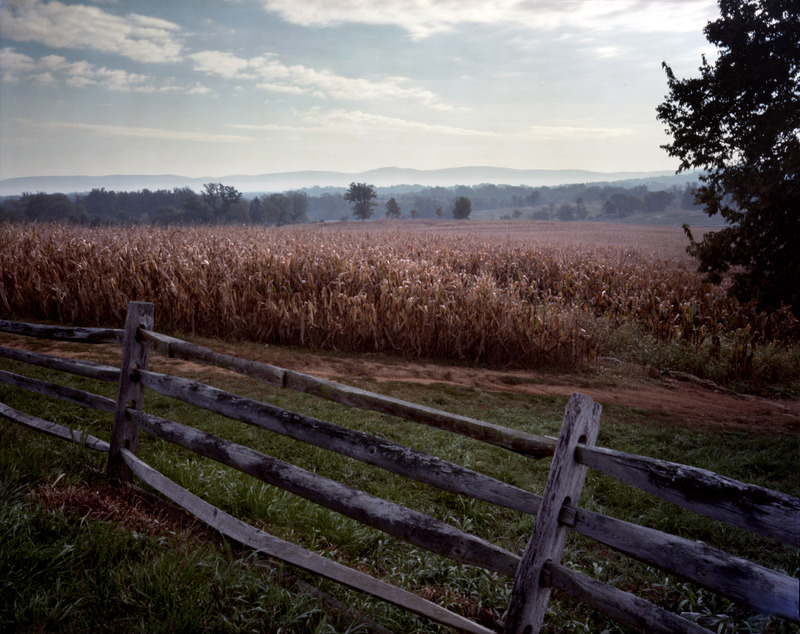 For hours, with no protection successive waves of Union troops were mauled in this open field trading shots with the well-concealed Confederate troops. The Battlefield at Antietam, so revealing and so wonderfully preserved, is a place where you can go and see and feel the American Civil War. My next trip, in a few weeks, would take me South and West, to the City of Vicksburg, Mississippi, to explore the beginnings of US Grant’s Vicksburg Campaign. Beautiful photos. Brings back memories of my own visit to Antietam a few years ago. These are amazing photos. I live near Sharpsburg and have seen these sites many times. These photos, though, give me a new appreciation of the sites, the images are such studies in contrasting beauty and appear layered. thanks Donna. That’s a beautiful part of the world you live in over there……please visit the Blog again as I’ll be updating through 2015. Joe, thanks for your comments on the Blog. I’ll be spending some quality time at Gettysburg this year, multiple trips, i will look up the Sherfy House on my travels. Check back as the Blog will be updated as the 150th anniversaries unfold through 2015. 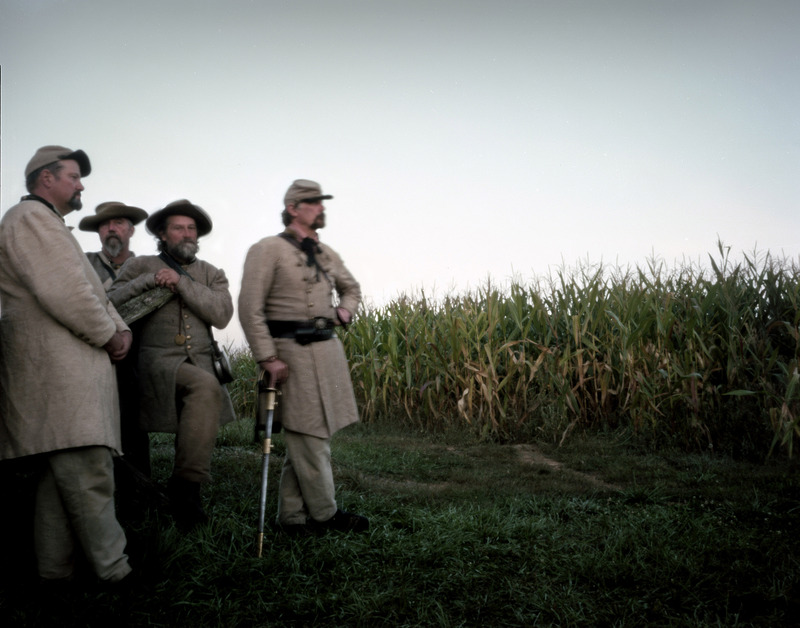 Chancellorsville, May 2013, Gettysburg July 2013 and so on…..
Love your photo of the Black Hats in the cornfield. 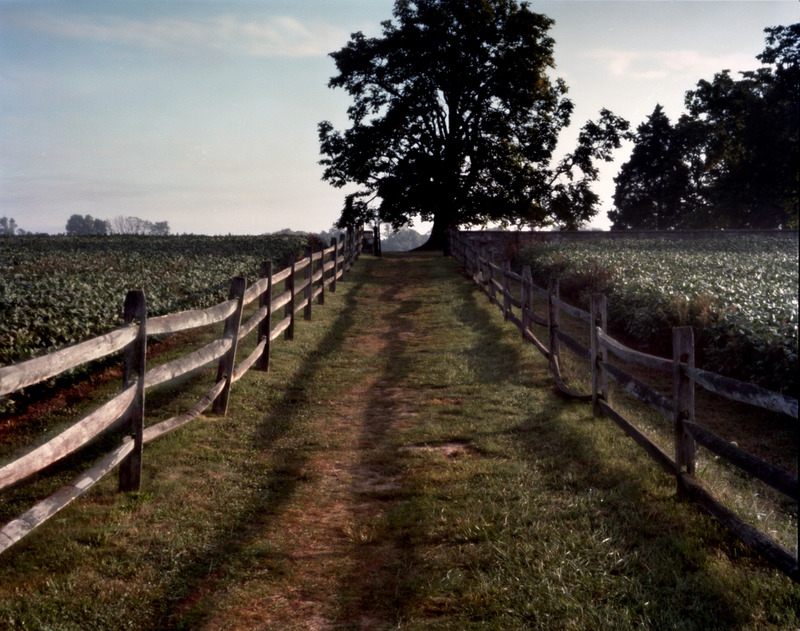 BTW, the Peach Orchard at Gettysburg was Joseph Sherfy’s and his house is right across the Emmitsburg Pike . It was in the thick of the fighting on the second day of the battle. Planning my shot list for Gettysburg and ill definitely be by the Sherfy house. Just finished Allen Guelzo’s new book, “Gettysburg – The Last Invasion” terrific and his insights on second day fighting, Peach Orchard etc, fantastic. Joe, are you a descendant of the Gettysburg Sherfy’s? Will you be in Gettysburg for the 150th? Yes, my father’s family was part of the line of Sherfy’s that lived in the house at Gettysburg. Unfortunately I will not be there but I do have a brother up the road from GB (in Dillsburg). Not sure what his plans are, he’s not as much of an historian as I am but he does actually dabble in photography. He has some nice stereoviews of the Sherfy house and Peach Orchard. See them here. If my brother had some nice period clothing you could get a photo of him at the house but he’s not a re-enactor (nor am I). I do look forward to your GB photos. Thanks. If you can get a reenactor in the photo that would be cool…. Great pictures! I was at the battlefield that day. I grew up in Sharpsburg during the Civil War Centennial – now live in Ohio. I do have to make one correction to your commentary. 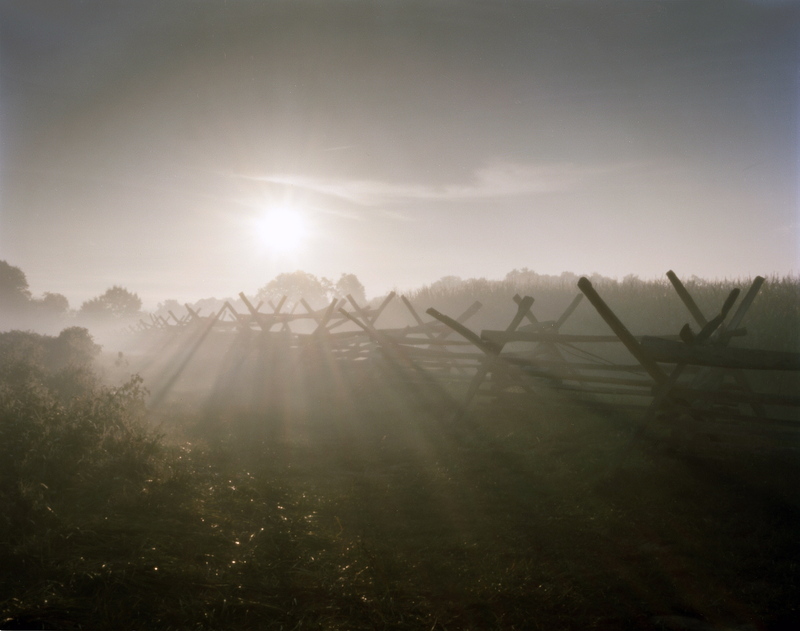 The total casualties at Antietam were @ 22,720 – that is dead, wounded and missing/captured, not 24,000 dead. Still, a horrific loss, not equaled in any other single day in American history. Keep up the good work. I stand corrected. Thanks for taking a look at the blog. Please check back as the Project follows the timeline of the Civil War and will be continually updated through 2015. I’ll immediately grab your rss feed as I can’t find your email subscription hyperlink or e-newsletter service. Do you have any? Kindly allow me understand in order that I may just subscribe. Thanks. hello, you can “follow” the blog by hitting the “follow” button at bottom right . U can also find my email on the contact page.